Converging lines of evidence point to an inextricable role of the endocannabinoid system in schizophrenia. Marijuana consumption (1) elicits psychotic symptoms similar to schizophrenia; (2) precipitates schizophrenia in susceptible individuals; (3) worsens psychosis; and (4) is more prevalent among schizophrenia patients. (5) Genetic linkage studies have mapped a locus around the CB1 cannabinoid receptor gene (CNR1), which potentially confers susceptibility to schizophrenia, and (6) within CNR1, several polymorphisms reportedly associate with this disease. (7) The endocannabinoid system controls brain areas and signalling systems implicated in schizophrenia, (8) and is overactive in patients, (9). It correlates with symptom severity and is reversible with certain antipsychotics. 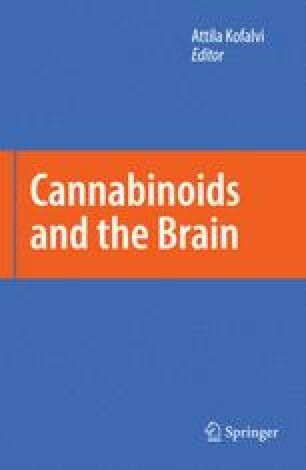 Finally, (10) the naturally occurring CB1 receptor antagonist cannabidiol exhibits a promising antipsychotic profile in pharmacological model-psychoses and schizophrenia. In summarizing the pertinent epidemiological and molecular data, we define schizophrenia as a manifestation of aberrant circuitry formation at the synaptic level and propose that the liability to develop psychosis is driven by imbalanced co-signalling between endocannabinoids and other neuromodulatory pathways already implicated in schizophrenia.